The Congress MP was responding to a question about his recent remark that no good Hindu would want a temple at the disputed Ram Janmabhoomi-Babri Masjid site. New Delhi: With the Ram Mandir movement gathering momentum, Congress leader Shashi Tharoor has said no Hindu text condones the use of violence to get one’s way and scriptures say people should build Ram in their hearts. “In fact, if anything, there is a scripture that says build Ram in your heart. 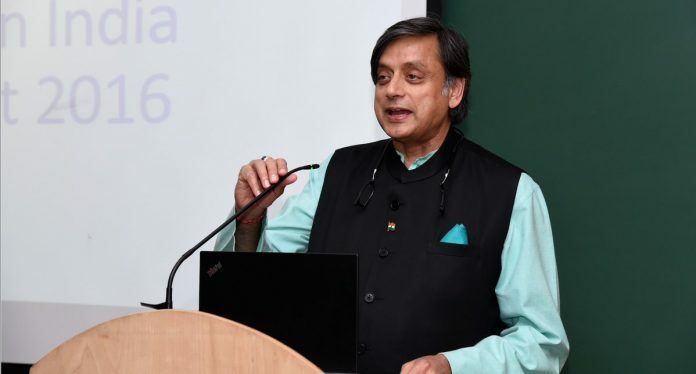 And if Ram is built in our heart it should little matter where else he is or he is not, because he is everywhere,” Tharoor said in an exclusive interview to PTI. Tharoor reiterated his point asking if a good Hindu would want to build a Ram Temple at the expense of an act of violence. “My only point is, would a Hindu have wanted to build such a precious place at the expense of conducting an act of violence. A good Hindu is a law-abiding Hindu. A good Hindu is someone who has ‘insaaniyat’,” the Congress leader asked. He went on to argue that while a good Hindu was also obviously somebody who worshipped and believed in his worship, Hindu scriptures do not allow the use of violence to have one’s way. “A good Hindu is also obviously somebody who worships and believes in his worship. But where have we been told in our Hindu texts and our Hindu teachings which, in fact since the days of Adi Shankaracharya, have emphasized much more on ahimsa. Where have we been told that we should conduct violence against other people to have our way,” questioned Tharoor. The Lok Sabha MP from Thiruvananthapuram also wondered what about his remarks had “shocked the BJP so much”. The Congress leader quoted Advani as having called the day of demolition of Babri Masjid as the “saddest day of his life”. “Advani said he would have respectfully wanted to relocate the site and Vajpayee had also hinted at all sorts of compromises provided the Ram Temple could also be built, it could even be a joint wall between a mosque and a temple. Who knows what Vajpayee would have wanted? He is not here to tell us but no, neither of them ever spoke in terms of demolishing the mosque and when it happened they both condemned it. So what am I saying that is so shocking for the BJP?” asked Tharoor. On the perception that majority Hindus want a Ram Temple at the site where evidence also suggests that a temple existed, Tharoor said this was an academic argument. “A temple really did exist. Whether it was the Ram Temple we don’t know. Definitely there were pillars underneath. But given the experiences of that period so many temples were destroyed and mosques built in their places. I am not challenging the historical veracity of this belief, that debate is over. That’s totally academic now,” said the Congress MP. He then asked if a Hindu would ever want to build such a precious place, a temple, at the expense of conducting an act of violence.